This paisley scarf is one of my favorites. It's not bulky, is in my favorite print, and has tassels. It's the perfect light layer for right now. Beautiful fall outfit. 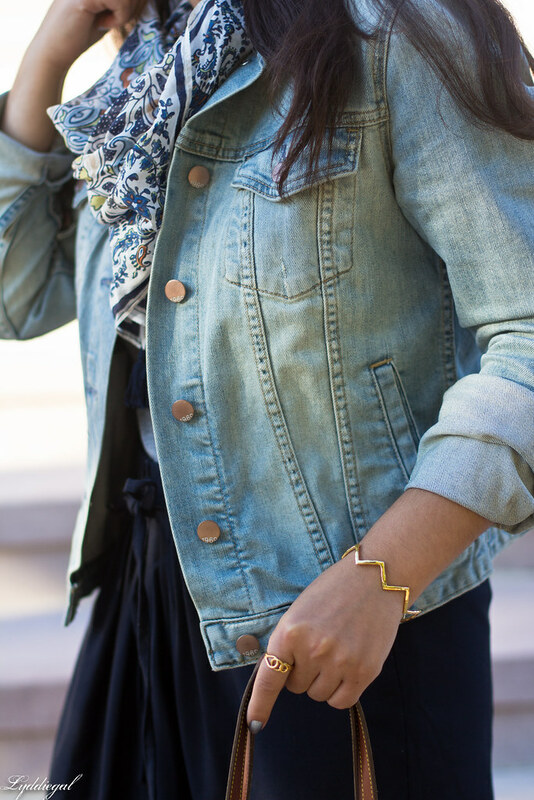 The denim jacket and the scarf go together so perfectly. I can't believe you that beautiful bag was thrifted....stunning! 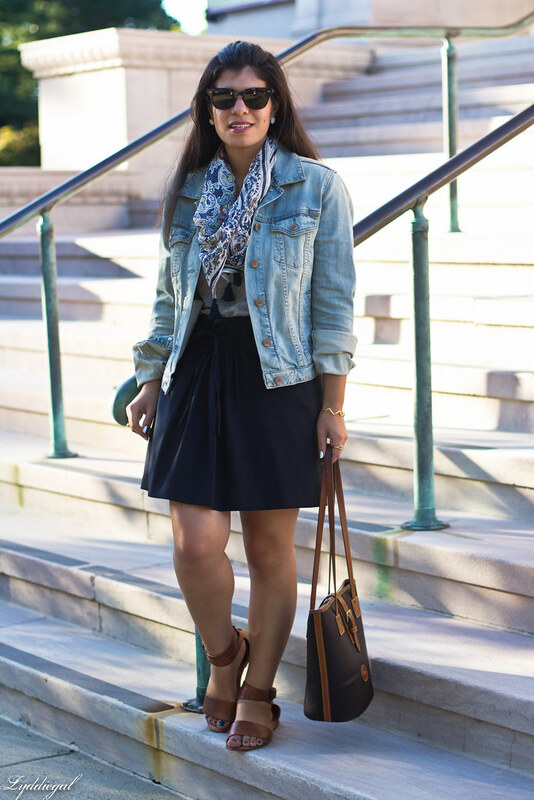 Bare legs, sunshine and scarves - does early fall get any better? I have to say, I don't think so; for my money, this is the perfect time of year and a perfect look to sum up everything that is wonderful about fashion at this time of year. Sandals are still appropriate, but you can throw on a jacket or sweater; sunglasses are still needed but so is scarf. For me, it's the perfect mix of everything I love about fashion and this is the time of year I truly wish would never end. That scarf is so cute! I really just love this entire outfit!!! 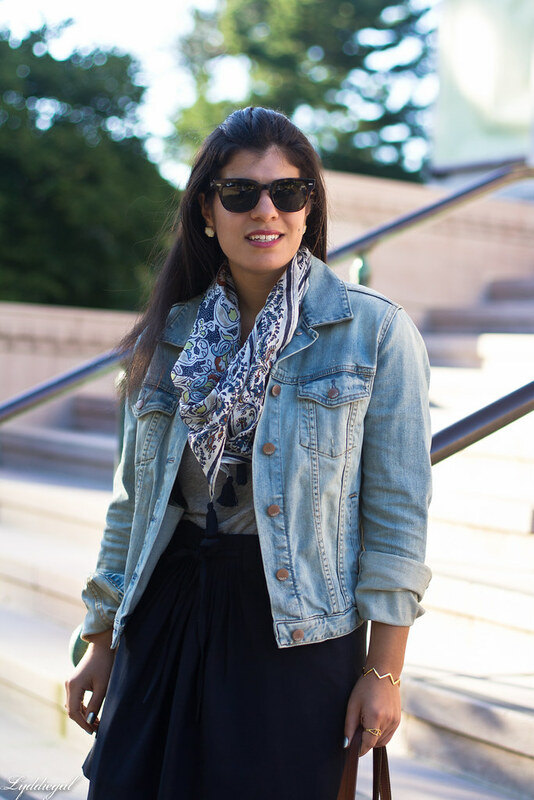 I love the pattern of your scarf, it goes so well with your denim jacket! You had me at tassels. Love it! If you ever get tired of everything in your closet feel free to send it my way. The tassels on your scarf are such a great detail. The tassels are so cute. I love the weather when you can still wear light layers and don't have to bury yourself under sweaters and coats. I'm still waiting for the true chill in the air here. I love the tassels and print! I keep seeing all these cute tassel scarves on people! This one is adorable! I need one for myself! 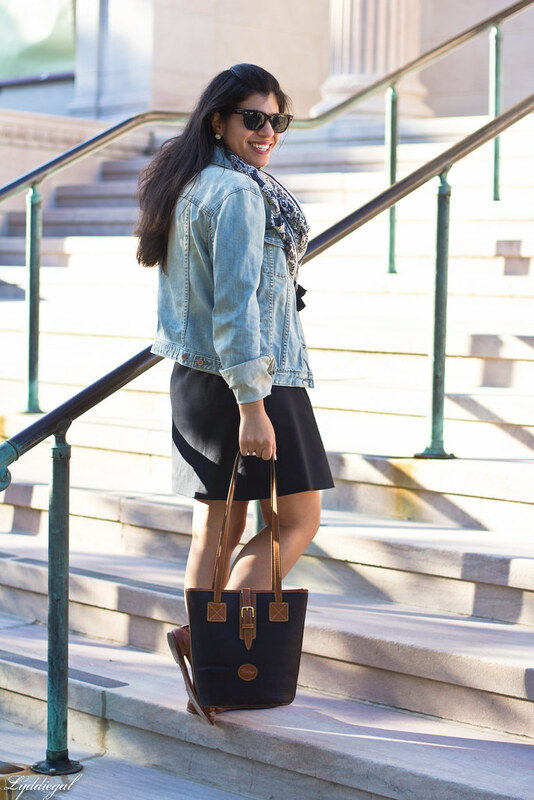 I can't wait to start wearing scarves--I've actually invested in some nicer ones that I found on sale this summer and am looking forward to creeping through your fall blog archives from last year to steal some outfit ideas. 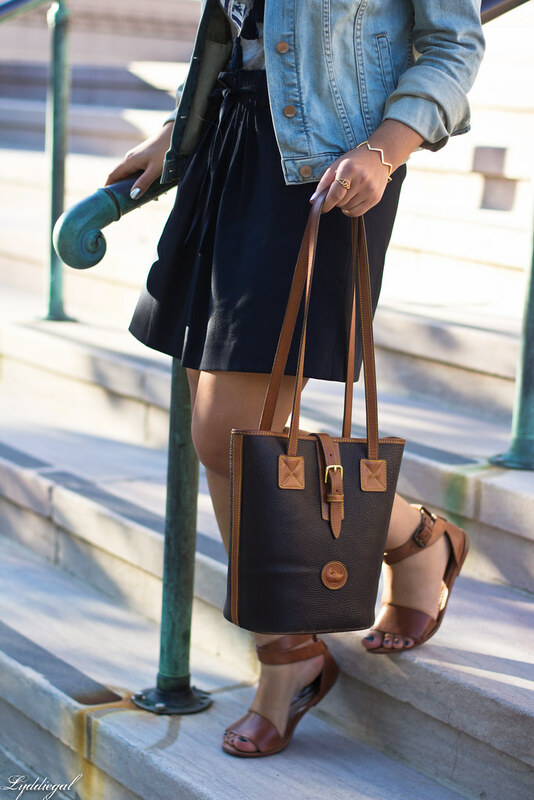 Working that denim beautifully, Lydia, and I adore your purse! Gorgeous layered look! So effortless chic! I sooo Love this chic outfit of yours and those cuff is really pretty. You look great ! This is such a cute outfit! I love the tassel scarf! It's the perfect addition. I would kill for bare legs right now. So jealous!! You look beautiful, Girl! Great looks! I love the fun scarf! What a great look--I love the jean jacket (always!) and the fun tasseled scarf. In fact I may just have to steal this one--I have similar items in my closet and I love this classic combo! I love this look so much. Nice scarf, cute draw-string skirt and cute sandals! !